It has been more than 2 decades since Otomo Katsuhiro's previous personal artbook KABA was published in 1989. After all these years, it's surprising that there are no reprints for that book, even though the publisher remains the same, 講談社 (Kodansha). So, if you missed out on KABA, don't miss out on KABA2. Just in case there are not going to be reprints for this as well. KABA2 is a large format hardcover similar in size to the first volume. It comes with a cardboard packaging with the big sticker of the cover art pasted over it. There are 204 pages collecting artwork from 1990 to 2011. Yes, Otomo Katsuhiro has been in the anime and manga industry for long time. The first chapter features works from Akira (1988), Steamboy (2004), Memories (1995), SOS! Tokyo Metro Explorers (1996) and several commercial work he did for other publications, even bicycle magazines. There is quite a wide variety of work not just for animated films. The art is beautiful. I really like the cover. Chapter headings are all made up of those little pin badges you see on the cover art. I prefer his manga style art, particularly the line works. His illustrations are very clear. You'll see some humorous ideas in the book using juxtaposition, like dogs wearing samurai suits. Orbital Era and Batman The Third Mask are just a few pages of manga which make up the thinnest chapters in the book. It's quite interesting to see Batman drawn in manga style, in Otomo style. Then there's the animation artwork section for concept art created for titles such as Freedom, Gundam: Mission to the Rise, Stink Bomb and a lot of other stuff I'm seeing for the first time. Many are actually background work, the concept design, for films that Otomo did not personally direct. There are lots of character designs, and also some mecha, robots, background art. The chapter on Cannon Fodder collects the film stills from the animated short. The style and character designs here are quite different from all his other works. The last chapter collects miscellaneous illustrations that don't fit anywhere, stuff like fruit-shaped bicycle helmets, an alternative cover for this art book which is just a nest floating above a strange stork, strange character sketches, film merchandise, and some collectibles. There are a few interviews on his creative process written in Japanese. It ends with a photo of his studio and you can see he's quite a cycling enthusiast as well from the two bicycles he have, maybe more. 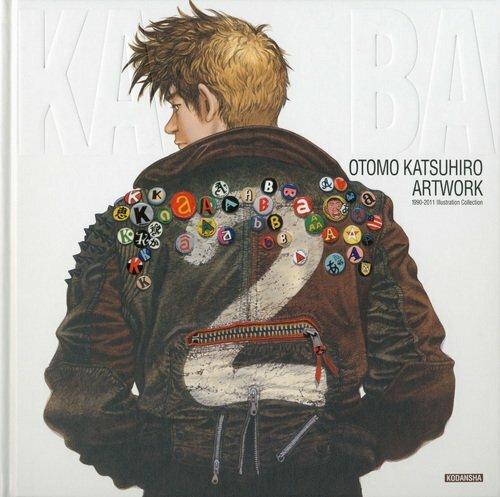 This is a fabulous art book from Otomo Katsuhiro. It's awe-inspiring. Highly recommended. There are no pictures and videos for this review because the publisher Kodansha Limited says it's a copyright infringement. if only it wasnt so much to send to new zealand..! Yeah I hear ya about postage to places like NZ and AU! But I've found these guys have a lot more reasonable postage. The only downside is that they don't always have the Japanese art book you are looking for. But if it is well known Japanese artist then they usually have it. You can check with animebooks.com, I usually get my japanese art books there, they got a lot of good stuffs at decent prices, although I don't know how much it'll ship to countries like New Zealand.